The VH series Commodore introduced in September 1981 brought moderately updated frontal bodywork, with a new bonnet and front guards to facilitate the reshaped headlamps and a horizontally-slatted grille. These front-end design changes worked to produce a longer, yet wider look. At the rear, sedans featured redesigned tail light clusters, the design of which borrowed from Mercedes-Benz models of the day, using a louvered design. At the same time, the nomenclature of the range was rationalised. The SL superseded the L as the base model, with the old SL level becoming the mid-range SL/X, and the SL/E remaining as the top-of-the-line variant. Wagons were restricted to the SL and SL/X trims. Redesigned pentagonal alloy wheels replacing the original SL/E type used since 1978 along with a black painted B-pillar, wrap-around chrome rear bumper extensions to the wheel arches, and extended tail lamps that converged with the license plate alcove distinguished the range-topping SL/E from other variants. Mechanical specifications carried over, except for a new five-speed manual transmission, optional on the 1.9 litre four-cylinder and 2.85 litre six-cylinder versions. In an attempt to improve sales figures of the inline-four engine, Holden spent considerable time improving its performance and efficiency. Modifications were also made to the 2.85 litre six to lift economy, and the powerplants managed to reduce fuel consumption by as much as 12.5 and 14 percent, correspondingly. Holden released the limited edition SS sports model in September 1982, provisioned with Holden's 4.2 litre or optional 5.0 litre V8. Both V8s were teamed with a four-speed manual transmission. Racing driver Peter Brock's HDT Special Vehicles business produced three upgrade versions, known as Group 1, Group 2 and Group 3. By the time of the VH series, Commodore sales were beginning to decline. Holden's six-cylinder engine, which was carried over from the Kingswood, could trace its roots back to 1963 and was no longer competitive. Continual improvements made to Commodore's Ford Falcon rival meant the VH was not significantly more fuel-efficient or better performing despite the smaller size. This was curtailed by the absence of any major powertrain revisions by the time of the VH and the lack of visual departure from the original VB. Holden also had to deal with the influx of their own mid-size Camira from 1982, which presented comparable interior volume with lower fuel consumption, and for less than the Commodore pricing point. 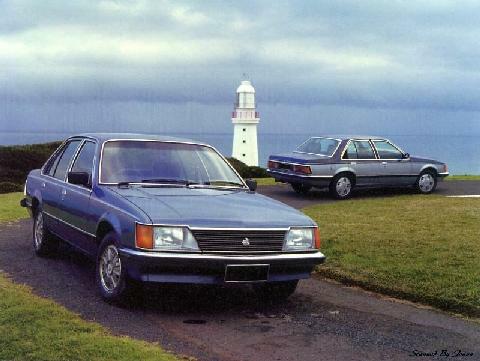 Camira sales were strong initially, but as fuel prices had stabilised, buyers gravitated away from Camira and Commodore towards the larger Falcon, which overtook the Commodore as Australia's bestselling car for the first time in 1982.